And finally, after two shadows [one] [two] and a completely unrelated song [here] we finished an official entry. As I mentioned before, we weren't going to touch the recent Presidential election. So we went the fictional route. In this case, the conceit is that the tiny Balkan country of Latveria is having an election, and the only name on the ballot is Doctor Doom. As usual, notes appear after the song. Every vote is for me! As I said, we decided to go the fictional route and write of a Balkan election where the only name on the ballot is that of Doctor Doom (nemesis of the Fantastic Four). The neat bit about this is that there IS a "Doom's Day" holiday in the FF comics, and it's whenever Doom decides. There was discussion on the Spintunes FaceBook group as to what constitutes an "election". While it's up to the judges, Spin's view was that it's a choice between two candidates. However, as there are "elections" just like this in the Real World, we feel it's safe. I subscribe to the principle that all the best villains believe themselves to be heroes. That's certainly the case for Doom. So he rules with an iron fist because he has to. And his deceptions are due to the fact that everyone else is an idiot who must be fed lies because they cannot process the truth. This "election" is the lie he tells to convey the deeper truth that he (and he alone) is Latveria's "legitimate" government. I was originally going to have more German in here. I was told it was confusing, so I scaled it back to the last verse here... the anthem. The result is a lot more narrative than I originally expected. I don't think writing those verses was wasted effort, though. One thing that struck me was that, when surrounded by German words, "Doktor Doom" sounds a lot like "Doctor Stupid" to me. I had to ask some friends if the character's name was translated in Germanic countries. It is not. Apparently they're just really good at compartmentalizing German vs. foreign sounds and meaning. Speaking of which, Doom himself speaks with an odd accent here. According to Marvel Wikia, the official languages of Latveria are German, Hungarian, Latverian (a local dialect that is a derivative of Hungarian) and Romany. So it's a mixed bag. However, Doom himself studied abroad, so I threw in a touch of American and Russian attitude as well. I think it unlikely that he sounds like any of his subjects any more than Queen Elizabeth II sounds like your average Brit. William Hoover seemed disappointed that I hadn't used much piano lately, so piano it is. And again, it's a little bit off. The feeling I'm going for here isn't really the comic books; and it certainly isn't from the recent movies. It's from the 1994 Fantastic Four film directed by Roger Corman. Watch it [it's on DailyMotion] to see if I nailed that. We end with a piece of my version of the Latverian National Anthem. 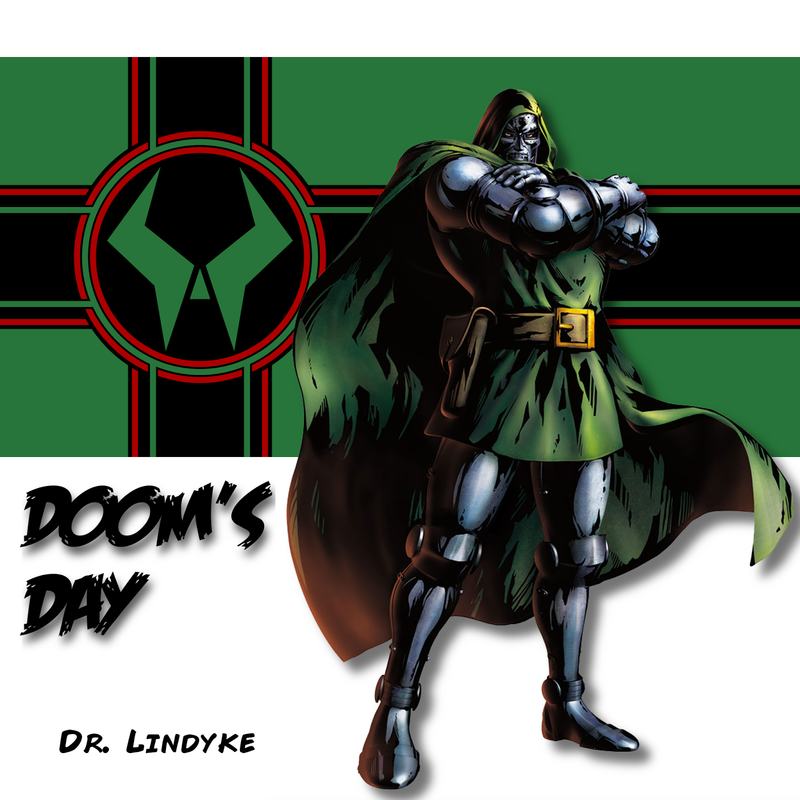 Praise to Latveria, and our King, Victor von Doom. That's all an anthem has to say, right? It's intended to remind us of a Russian heroic song. I was going to shift away from the tango here and bring in the "big instruments" since the anthem has a much more regimented tempo, but then I thought, no... I'm just going to have them stomp all over that tango. I also used it, toned down and without vocals, for the intro and musical bridge.